Numbered 70/75 in pencil in the lower left margin. 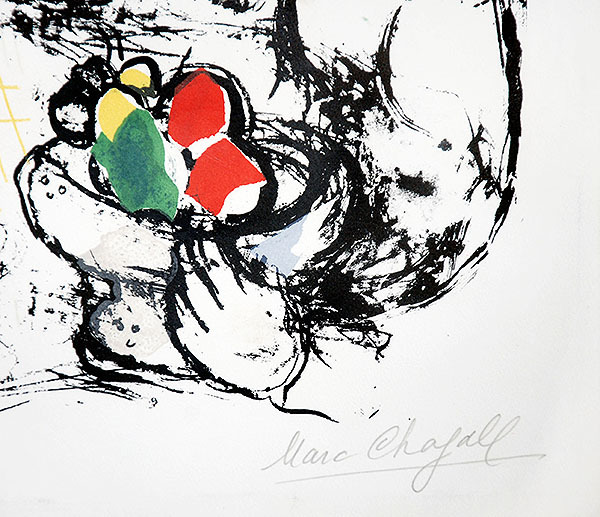 Hand-signed by Marc Chagall (Vitebsk, 1887 - Saint-Paul, 1985) in pencil in the lower right margin. This work is in very good condition. 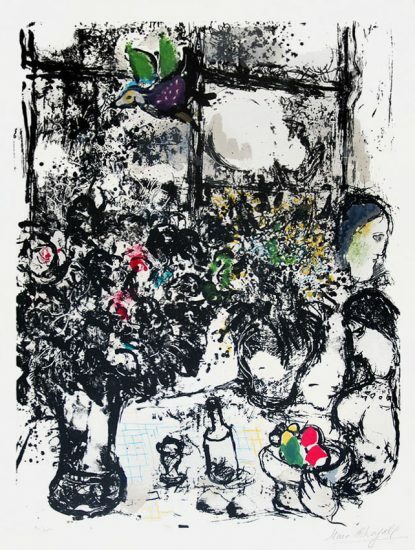 Even a Master such as Chagall, who could create the magical likes of Nature morte au bouquet (Still Life with Bouquet), 1960, needed a little encouragement now and then. 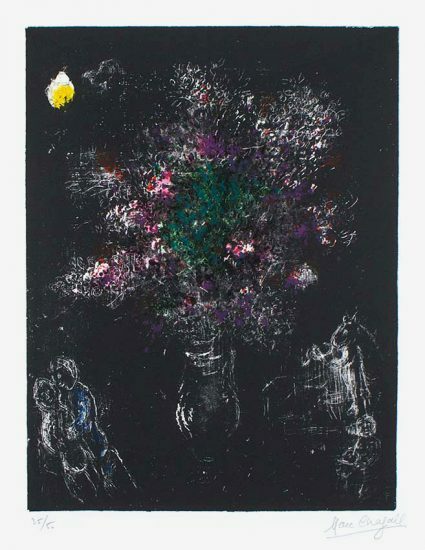 Fernand Mourlot, who hosted the artist in his printing studio many times, describes "soliloquies" he would recite to guide his art making: "…The color must be integrated with the drawing the way diction is with singing,… it's like the sun coming into the garden…" (14). 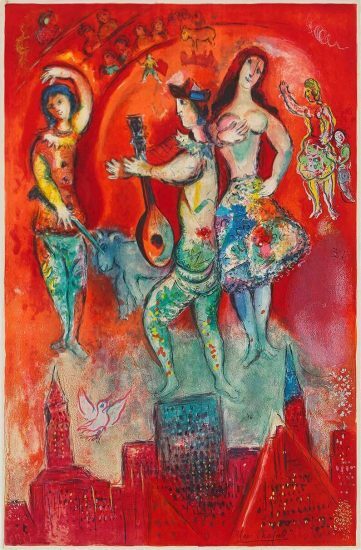 It's quite wonderful to imagine Chagall reminding himself to always return to the core characteristics of his personal style. In Still Life with Bouquet, splashes of color applied with great economy punctuate the exuberant black drawing of the print. 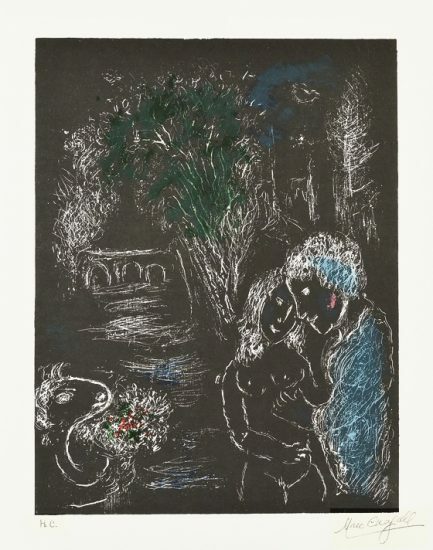 Chagall adds further detail by going back into the tusche - oily ink used to draw on the lithographic stone - and carving out lines, perhaps with the end of his brush. 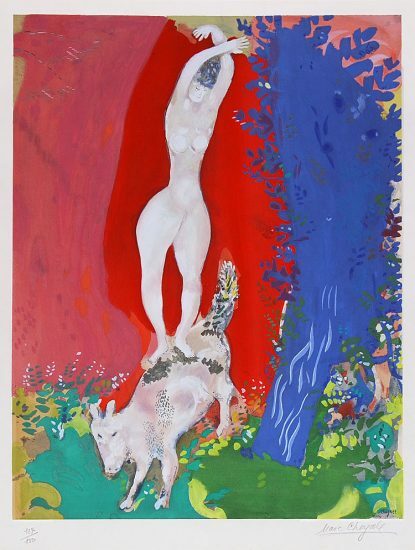 An all-over exuberance in the material unifies the print, making this one of the artist's best and most collectible lithographs from this time period. 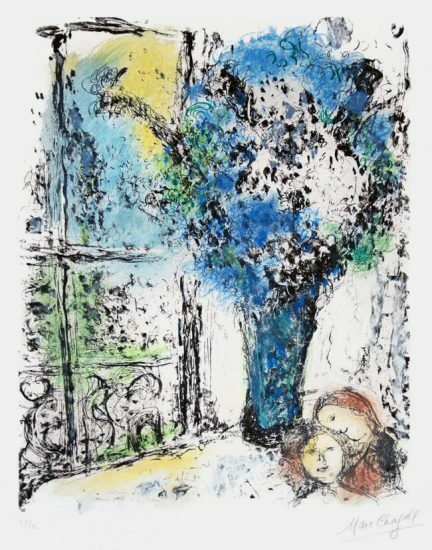 Created in 1960, this original color lithograph on Arches paper is hand-signed by Marc Chagall (Vitebsk, 1887 - Saint-Paul, 1985) in pencil in the lower right margin. 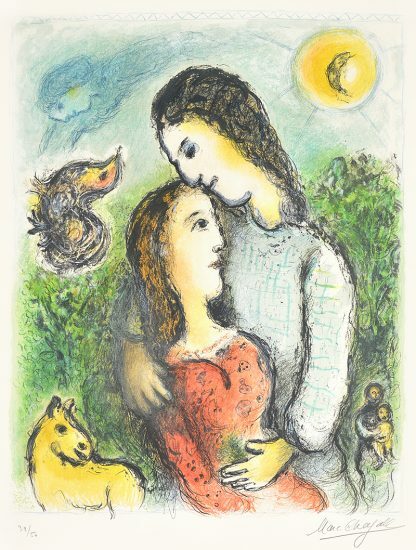 From the numbered and signed edition of 75, this work is numbered 70/75 in pencil in the lower left margin. 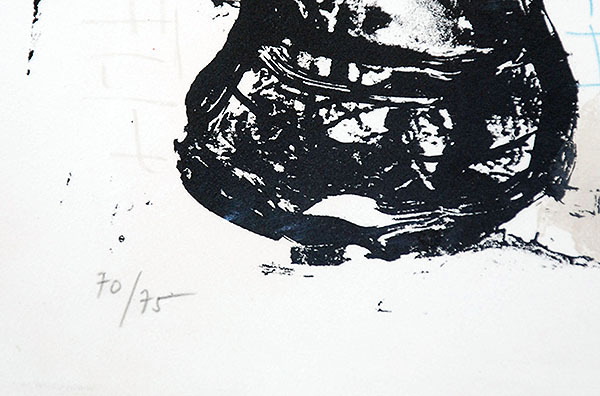 A few artist's proofs exist aside from the numbered edition. 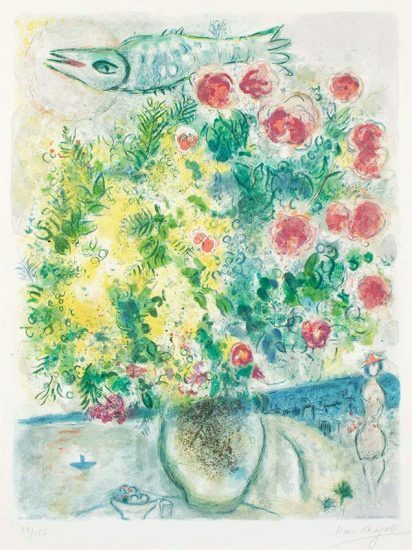 Marc Chagall Still Life with Bouquet (Nature morte au bouquet), 1960 is fully documented and referenced in the below catalogue raisonnés and texts (copies will be enclosed as added documentation with the invoices that will accompany the final sale of the work). 1. Mourlot, Fernand. 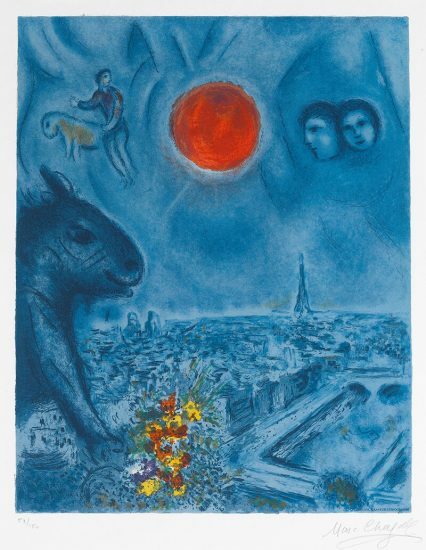 The Lithographs of Chagall: 1957-1962. Boston: Boston Book and Art Shop, Inc., 1963. Listed and illustrated on pp. 112-13 as catalogue raisonné no. 299. 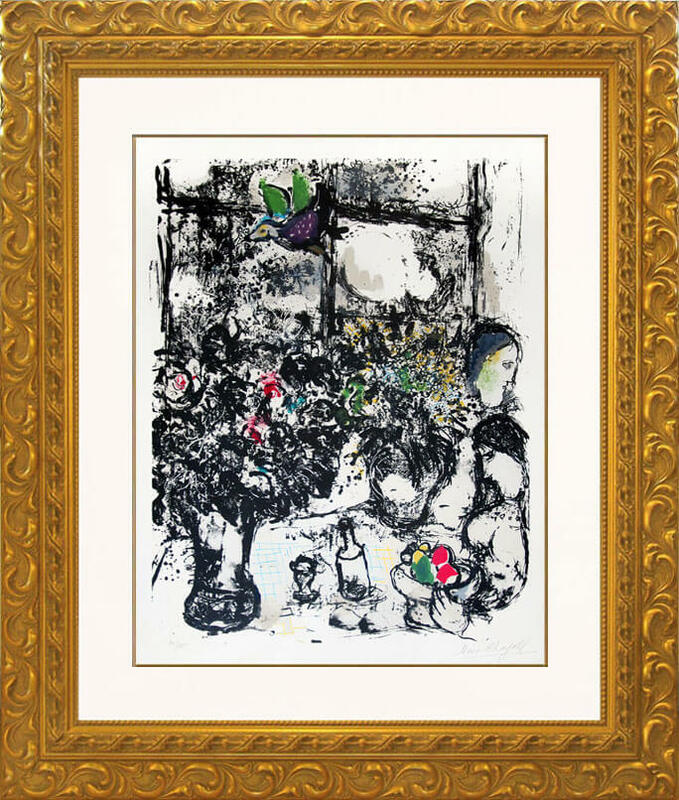 Framed in archival materials, Marc Chagall Still Life with Bouquet (Nature morte au bouquet), 1960 is presented in a complementary moulding finished with silk-wrapped mats and matching fillet. It is protected by optical-grade Plexiglas.